I came here as a protest but I'm staying because I like it. I still hop back and forth but I'm hoping - or is that hopping - to commit. If Mark Twain and Mel Brooks had ever collaborated, they would have invented a comic character like Henry(etta) Shackleford, a light-skinned slave boy who is freed by the American Abolitionist John Brown and who passes as a girl for most of The Good Lord Bird. 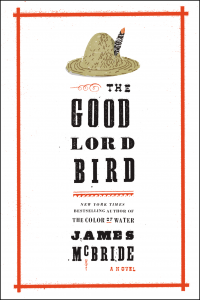 It is lucky for us that James McBride thought to create him and to place him at the center of John Brown's bloody and quixotic leap into immortality. As the first person narrator, Henry paints a complex portrait of Brown that is both laudatory and mildly mocking. Among the novel's many pleasures are the different metaphors he employs to describe Brown's madness: "Seemed like his peanut had popped out of his shell";"he was as upside down as them two rivers"; "a bit off his biscuit." He never denigrates Brown's selfless martyrdom, but he takes glee in describing Brown's penchant for prolonged prayer: "Old John Brown could work the Lord into just about any aspect of his comings and goings in life, including using the privy....I'd say on average he prayed about twice an hour, not counting meals." Although Henry is caught in the crosscurrents of slavery, terrorism, fanaticism and farce, he maintains a pragmatic optimism and a keen sense of the absurd: "I was never hungry when I was a slave. Only when I got free was I eating out of garbage bags." Henry, like Twain's Huck Finn, is an irreverent observer of human behavior. He gradually comes under Brown's spell: "He was a good kind lunatic, and he couldn't no more be a sane man in his transactions with his fellow white man than you and I can bark like a dog, for he didn't speak their language." By the time they reach Harpers Ferry, typically later than they'd planned, they'd lost both Frederick Douglas and Harriet Tubman. Without them the anticipated slave insurrection never happens. McBride adroitly balances the multiple myths swirling around Brown and the other historical figures without ignoring the humor inherent in their various contradictions. Not only has he made an important contribution to historical fiction, but in the character of Henry, he has injected a little sass - and a whole lot of sense - into the ongoing conversation about race in America.